In a day and age where information is exchanged freely and in many different formats, identity theft is bigger than ever. 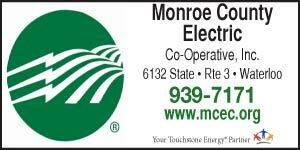 This tax season, the Monroe County Sheriff’s Department received several calls of identity theft, including situations in which several county residents attempting to “e-file” their taxes were notified by the IRS that someone else had already filed using their social security number. When an individual realizes their identity has been stolen, whether it be credit card information or anything else that could compromise financial security, the victim should report the incident to the sheriff’s department immediately. The sheriff’s department also recommends reporting identity theft to the post office, social security administration and state department, if applicable. A representative from the sheriff’s department will provide the individual with an “Identity Theft Victim Kit,” which consists of information from Illinois Attorney General Lisa Madigan, a complaint form, FAQs and steps to help ensure the future safety of personal information. Persons who have had their social security number used fraudulently are encouraged to notify the IRS immediately. The IRS website encourages those who have been affected or are concerned with being a victim to only give a social security number when required, check their credit report every 12 months and secure personal information in the home by using firewalls, antivirus software and changing Internet passwords regularly. Contact the Monroe County Sheriff’s Department for more information at 939-8681, ext. 236.